Pramerdorfer Ch, Kampel M., “3D upper-body pose estimation for detecting unhealthy sitting postures at the workplace”, submitted to Pattern Recognition Letters – Special Issue on Learning and Recognition for Assistive Computer Vision, June 2018. Kampel M., Sarkisjan J. “Pottery data quantification”, in The Encyclopedia of Archaeological Sciences, Wiley-Blackwell, ISBN: 978-0-470-67461-1, 2018. Takenga, C.; Berndt, R.-D.; Si, E.; Qiao, G.; Diem, M.; Gau, M.; Kampel, M.; Dworzak, M.: “Development of a Telemedical Network supporting an Automated Flow Cytometric Analysis for the Clinical Follow-up of Leukaemia”. Int. Journal of Medical, Health, Biomedical, Bioengineering and Pharmaceutical Engineering, p. 459-464, 10(9), 2016. Anwar H., Zambanini S., Kampel M. “Efficient Scale- and Rotation-Invariant Encoding of Visual Words for Image Classification“, IEEE Signal Processing Letters, 22(11):1762-1765, October 2015. Kleber F., Pramerdorfer C., Wetzinger E., Kampel M. “Optical Sensor Evaluation for Vision Based Recognition of Electronics Waste”, Int. Journal of Environmental Science and Development, 6(12), pp. 929-933, 2015. 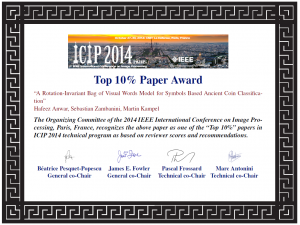 Anwar H., Zambanini S., Kampel M., Vondrovec K. “Ancient Coin Classification Using Reverse Motif Recognition“, IEEE Signal Processing Magazine – Special Issue on Signal Processing for Art Investigation, 32(4):64-74, July 2015. Kampel M., Zambanini S., “Shape Analysis and Geometric Modelling” in Mathematics and Archaeology, Juan A. Barcelo, Igor Bogdanovic (Eds. ), pp. 137-156, CRC Press, June 2015. Anwar H., Zambanini S., Kampel M. “Coarse-Grained Ancient Coin Classification Using Image-Based Reverse Side Motif Recognition“, Machine Vision and Applications, 26(2-3):295-304, April 2015. Reiter, M.; Hoffmann, J.; Kleber, F.; Schumich, A.; Peter, G., Kromp, F.; Kampel, M.; Dworzak, M. “Towards automation of flow cytometric analysis for quality-assured follow-up assessment to guide curative therapy for acute lympholastic leukaemia in children”, Magazine of european medical oncology (memo), Springer, DOI 10.1007/s12254-014-0172-6, 2014. Kavelar A., Zambanini S., Kampel M. “Reading the Legends of Roman Republican Coins“, Journal on Computing and Cultural Heritage, 7(1), 2014. Planinc R., Ortlieb S., Carbon C.-C., Kampel M. “User-Centered Design and Evaluation of an Ambient Event Detector Based on a Balanced Scorecard Approach“, Int. Journal On Advances in Life Sciences, 5(3-4), pp. 237-249, December 2013. Planinc R., Kampel M. “Introducing the use of depth data for fall detection”, Personal and Ubiquitous Computing, Vol 17(6), pp1063-1072) 2013. Huber-Mörk R., Nölle M., Rubik M., Hödlmoser M., Kampel M., Zambanini S. “Automatic Coin Classification and Identification”, Advances in Object Recognition Systems, Dr. Ioannis Kypraios (Ed. ), ISBN: 978-953-51-0598-5, InTech, 2012. Huber-Mörk R., Zambanini S., Zaharieva M., Kampel M. “Identification of Ancient Coins Based on Fusion of Shape and Local Features”, Machine Vision and Applications, pp.1-12, 2010. Sablatnig R., Kampel M., Lettner M. (Eds.) “15th Int. Conf. on Virtual Systems and Multimedia“, IEEE, 2009. Kampel M., Huber-Mörk R., Zaharieva M. “An intelligent system for image based retrieval and identification of ancient coins”, IEEE Intelligent Systems, 24(2), pp. 26-34, 2009. Kampel M. , Wildenauer H., Blauensteiner P. and Hanbury A. “Improved motion segmentation based on shadow detection”, ELCVIA Electronic Letters on Computer Vision and Image Analysis, vol 6(3), pp. 1-12, 2007. Kampel M., Sablatnig R. “Rule based system for archaeological pottery classification”, Pattern Recognition Letters, 28(6), pp. 740-747, 2007. Kropatsch W., Kampel M., Hanbury A. (Eds. ), “Computer Analysis of Images and Patterns”, Vol. 4673 of Lecture Notes in Computer Science, Springer, Berlin, Heidelberg, New York, Wien, 2007. Thirde D., Borg M., Aguilera J., Wildenauer H., Ferryman J., Kampel M. “Robust Real-Time Tracking for Visual Surveillance”, EURASIP Journal on Advances in Signal Processing, vol. 2007, Article ID 96568, pages 23, 2007. Kampel M., Sablatnig R. “An Automated Pottery Archival and Reconstruction System”, Journal of Visualization and Computer Animation, Vol. 14, pp. 111-120, 2003. Sablatnig R., Kampel M. “Model-based Registration of Front- and Backviews”, Computer Vision and Image Understanding, Vol 87(1), pp. 90-103, 2002. Atanasov M., Kampel M., “Automated Determination of Gait Parameters Using Depth Based Person Tracking”, 16th IEEE Int. Conference on Embedded and Ubiquitous Computing, Bukarest ISBN: 978-1-5386-8295-1; S. 96 – 102, 2018. Scheithe J., Kampel M., Licandro R.,”Monitoring Acute Lymphoblastic Leukaemia Therapy with Stacked Denoising Autoencoders”, Int. Conference on Clinical and Medical Image Analysis (ICCMIA18), to appear, Coimbatore, 2018. Licandro R. and Schlegl T., Reiter M., Diem M., Dworzak M., Schumich A., Langs G., Kampel M., “WGAN Latent Space Embeddings for Blast Identification in Childhood Acute Myeloid Leukaemia, 24th Int. Conference on Pattern Recognition (ICPR), Beijing, August 2018. Kampel M., Doppelbauer S., Planinc R., “Automated Timed Up and Go Test for functional decline assessment of older adults”, 12th EAI Int. Conference on Pervasive Computing Technologies for Healthcare, ISBN: 978-1-4503-6450-8, pp. 208-216, New York, May 21-24, 2018. Schurischuster S., Remeseiro B., Radeva P., Kampel M. , A Preliminary Study of Image Analysis for Parasite Detection on Honey Bees. In: Campilho A., Karray F., ter Haar Romeny B. (eds) Image Analysis and Recognition (ICIAR 2018), pp 465-473, 2018. Licandro R., Reiter M., Diem M., Dworzak M., Schumich A., Kampel M. “Application of Machine Learning for Automatic MRD Assessment in Paediatric Acute Myeloid Leukaemia”. 7th Int. Conference on Pattern Recognition Applications and Methods (ICPRAM), Funchal Madeira (Portugal), January 2018. J. Sarkisjan, M. Kampel, “A practical investigation for 3D pottery acquisition”, In Proc. of the 3rd IMEKO Int. Conference on Metrology for Archaeology and Cultural Heritage (MetroArchaeo), ISBN: 978-92-990084-0-9, pp. 64-68, 2017. Pramerdorfer C., Kampel M., “Deep Objective Image Quality Assessment”, 17th international Conference on Computer Analysis of Images and Patterns, pp. 127-138, Ystad, Sweden, August 2017. Wächter N., Kampel M., “There is no privacy, deal with it-Teenagers’ challenge and strategies in using social media” in 13th Conference of the European Sociological Association, Athen, August 2017. Licandro R., Langs G., Kampel M., “Spatio Temporal Modelling of Dynamic Developmental Patterns”, Medical Image Computing Summer School (MedICSS), London (United Kingdom), July 2017. Schurischuster S., Zambanini S., Kampel M., Lamp B. “Sensor Study for Monitoring Varroa Mites on Honey Bees (Apis mellifera)“, Proceedings of the Visual observation and analysis of Vertebrate And Insect Behavior (VAIB) Workshop, Cancun, Mexico, December 2016. Planinc R., Chaaraoui A., Kampel M., Florez-Revuelta F., Computer Vision for Active and Assisted Living. In F. Florez-Revuelta & A. A. Chaaraoui (Eds. ), Active and Assisted Living: Technologies and Applications (pp, 57-79). London, United Kingdom: The Institution of Engineering and Technology. Pramerdorfer C., Planinc R., Van Loock M., Fankhauser D., Kampel M., Brandstötter M., “Fall Detection Based on Depth-Data in Practice”, European Conference on Computer Vision (ECCV) Workshops, pp. 195-208, Amsterdam, The Netherlands, October 2016. Wetzinger E., Atanasov M., Kampel M., “Person Profiling Using Image and Facial Attributes Analyses on Unconstrained Images Retrieved from Online Sources”, Int. Conference on Image Analysis and Recognition, Póvoa de Varzim, Portugal, July 2016. Licandro R., Rota P., Reiter M., Kleber F., Diem M., Kampel M., “Automatic Detection of Leukaemic Cells in Flow Cytometric Data for Minimal Residual Disease Assessment”, EuroScience Open forum (ESOF) – Marie Skłodowska-Curie Actions Satellite Event ‘Research and Society’, Manchester, UK, July 2016. Licandro R., Rota P., Reiter M., Kampel M., “AutoFLOW: a novel heuristic method to automatically detect leukaemic cells in flow cytometric data“, 3rd Austrian Biomarker Symposium 2016 on early diagnostics, Vienna, Austria, March 2016. Licandro R., Langs G., Kampel M., “Spatio Temporal Modelling of Dynamic Developmental Patterns”, Int. Computer Vision Summer School (ICVSS), Sicily, Italy, July 2016. Wetzinger E., Kampel M., “The Profiler – Media Education for 10-15 Years Old Pupils using Image Analysis and an Interdisciplinary Project Approach”, in Proc. of the Int. Conf. ‘The Future of Education’, Edition 6, Florence, Italy, July 2016. Wanka A., Psihoda S., Planinc R., Kampel M. “Combining Technical and User Requirement Analysis to Support Wellbeing at the Workplace”, Proceedings of the Int. Conference on Ambient Assisted Living (IWAAL), pp. 101-112, Puerto Caras, Chile, December 2015. Wiedemann L.G., Planinc R., Nemec I., Kampel M. “Performance Evaluation of Joint Angles obtained by the Kinect v2”, Proceedings of the Int. Conference on Technologies for Active and Assisted Living (TechAAL), London, United Kingdom, November 2015. Kampel M., Wetzinger, E.; Atanasov, M.; Weidinger, K.; Tschol, M. “Improving Media Literacy among 10-15 Years-Olds using Image Analysis”, Int. Conference on Advances in Education and Social Sciences – Abstracts & Proceedings , ISBN: 978-605-64453-4-7; Paper Nr. 297, 10 S., Istanbul, Türkei, October 2015. Weegh, H; Kampel, M. “Acceptance criteria for vision based fall detection”, Proc. of Advancing Assistive Technology and eAccessibility for People with Disabilities and the Aging Population (AAATE), Sept. 2015. Hödlmoser, M.; Wolf, P.; Kampel, M. “Simplifying Indoor Scenes for Real-Time Manipulation on Mobile Device“, Computer Analysis of Images and Patterns, pp. 482-493, 2015. Kleber, F.; Pramerdorfer, C.; Wetzinger, E.; Kampel, M.: Optical Sensor Evaluation for Vision Based Recognition of Electronics Waste, In 6th International Conference on Environmental Science and Development, 6 (12), pp. 929-933, Amsterdam, Netherlands, 2015. Anwar H., Zambanini S., Kampel M. “Invariant Image-Based Species Classification of Butterflies and Reef Fish“, Procs. of the Workshop on Machine Vision of Animals and their Behaviour, British Machine Vision Conference, pp. 5.1-5.8, Swansea, UK, September 2015. Pramerdorfer C., Kampel M. “A Dataset for Computer-Vision-Based PCB Analysis”, Proc 14th IAPR International Conference on Machine Vision Applications, pp. 378-381, Tokyo, Japan, May 2015. Planinc R., Kampel M. “Local Behavior Modeling based on Long-Term Tracking Data”, Proceedings of the IAPR International Conference on Machine Vision Applications (MVA), pp. 303-306, Tokyo, Japan, May 2015. Pramerdorfer, C.; Kampel, M. “PCB Recognition Using Local Features for Recycling Purposes”, Proc. 10th International Conference on Computer Vision Theory and Applications, pp. 71-78, Berlin, Germany, March 2015. Kleber, F.; Kampel, M. “Pre-Analysis of Printed Circuit Boards based on Multispectral Imaging for Vision Based Recognition of Electronics Waste.” 17th Int. Conference on Environmental and Natural Resources Engineering (online), Miami, Florida, US, 2015. Planinc R., Hödlmoser M., Kampel M. “Enhancing the Wellbeing at the Workplace“, Proceedings of the International Conference on eHealth, Telemedicine, and Social Medicine (eTelemed), pp. 213-216, Lisbon, Portugal, February 2015. Planinc R., Kampel M. “Human Centered Scene Understanding based on Depth Information – How to Deal with Noisy Skeleton Data?“, Proceedings of the 10th International Symposium on Visual Computing (ISVC), pp. 609-618, Las Vegas, USA, December 2014. Wiedemann L.G., Planinc R., Kampel M. “Ergonomic-Monitoring of Office Workplaces using Kinect“, Proceedings of the 6th International Workconference on Ambient Assisted Living (IWAAL), Belfast, pp. 275-278, Northern Ireland, December 2014. Anwar H., Zambanini S., Kampel M. “Encoding Spatial Arrangements of Visual Words for Rotation-invariant Image Classification“, Proc. of 36th German Conference on Pattern Recognition (GCPR), pp. 443-452, Münster, Germany, September 2014. Planinc R., Kampel M. “Combining Spatial and Temporal Information for Inactivity Modeling”, Proceedings of the 22nd International Conference on Pattern Recognition (ICPR), pp. 4234-4239, Stockholm, Sweden, August 2014. Reiter, M.; Kleber, F.; Gau, M.; Dworzak, M.; Kampel, M. “AutoFLOW – Automation of Flow Cytometric Analysis for Quality Assured Follow-up Assessment to Guide Curative Therapy for Acute Lymphoblastic Leukaemia in Children“, Project Overview Poster, Biomarker Symposium Vienna, 2014. Planinc R., Kampel M. “Detecting Unusual Inactivity by Introducing Activity Histogram Comparisons”, Proceedings of the International Conference on Computer Vision Theory and Applications (VISAPP 2014), pp. 313-320, Lisbon, Portugal, January 2014. Planinc R., Kampel M. “Detecting Changes in Elderly’s Mobility Using Inactivity Profiles“, Proceedings of the International Work-conference on Ambient Assisted Living (IWAAL 2013), pp. 100-103, Carillo, Costa Rica, December 2013. Planinc R., Nake I., Kampel M. “Exergame Design Guidelines for Enhancing Elderly’s Physical and Social Activities“, Proceedings of The Third International Conference on Ambient Computing, Applications, Services and Technologies (AMBIENT 2013), pp. 58-63, Porto, Portugal, September 2013. Kavelar A., Zambanini S., Kampel M. “The ILAC-Project: Supporting Ancient Coin Classification by Means of Image Analysis“, XXIV International CIPA Symposium Strasbourg, France, September 2013. Anwar H., Zambanini S., Kampel M. “Supporting Ancient Coin Classification by Image-Based Reverse Side Symbol Recognition“, 15th International Conference on Computer Analysis of Images and Patterns, pp. 17-25, York, UK, August 2013. Zweng A., Kampel M. “Introducing a Inter-frame Relational Feature Model for Pedestrian Detection”, Scandinavian Conferences on Image Analysis (SCIA 2013), pp. 225-235, Espoo, Finland, June 2013. Hoedlmoser, M.; Micusik, B.; Kampel, M. “Sparse Point Cloud Densification by Using Redundant Semantic Information”, Proc. of the 3rd Int. Conf. on 3D Vision (3DV), Seattle, USA, June 2013. Hoedlmoser, M.; Micusik, B.; Pollefeys, M.; Liu, M.-Y. ; Kampel, M. “Model-Based Vehicle Pose Estimation and Tracking in Videos Using Random Forests”, Proc. of the 3rd Int. Conf. on 3D Vision (3DV), Seattle, USA, June 2013. Anwar H., Zambanini S., Kampel M. “A Bag of Visual Words Approach for Symbols-Based Coarse-Grained Ancient Coin Classification“, ÖAGM/AAPR 2013 – The 37th Annual Workshop of the Austrian Association for Pattern Recognition, Innsbruck, Austria, May 2013. Kavelar A., Zambanini S., Kampel M. “Reading Ancient Coin Legends: Object Recognition vs. OCR“, 37th Annual Workshop of the Austrian Association for Pattern Recognition (ÖAGM/AAPR 2013), Innsbruck, Austria, May 2013. Anwar H., Kampel M., Din I. “Flexible Projector Calibration for Fringe Projection based 3D Scanning Systems”, 18th Computer Vision Winter Workshop (CVWW 2013), Hernstein, Austria, February 2013. Planinc R., Kampel M. “E-Health System Development based on End User Centered Design”, Proceedings of the 5th International Conference on eHealth, Telemedicine, and Social Medicine (eTELEMED 2013), pp. 83-86, Nice, France, February 2013. Zweng, A.; Rittler, T.; Kampel, M. “A Flexible Relational Feature Model for Fall Detection”, 10th Int. Conference on Signal Processing, Pattern Recognition and Applications (SPPRA 2013), pp.535-542, Innsbruck, Austria, February 2013. Anwar, H.; Kampel, M.; Khan, R. “Recent Progress in Attributes Based Learning: A Survey”, 10th Int. Conference on Signal Processing, Pattern Recognition and Applications (SPPRA 2013), Innsbruck, Austria, February 2013. Zweng, A.; Kampel, M. “Performance Evaluation of an Improved Relational Feature Model for Pedestrian Detection”, 15th IEEE Int. Workshop on Performance Evaluation of Tracking and Surveillance (PETS 2013), Clearwater Beach, Florida, Jan. 2013. Planinc R., Kampel M. “Robust Fall Detection by Combining 3D Data and Fuzzy Logic”, ACCV Workshop on Color Depth Fusion in Computer Vision, pp. 121-132, Daejeon, Korea, November 2012. A. Zweng, M. Kampel “Using Depth Cameras and a Relational Feature Model for People Detection”, 25th Int. Conference on Intelligent Robots and Systems (IROS’12, CDCFR), Vila Moura, Algarve, October 2012. M. Hoedlmoser, B. Micusik, M.-Y. Liu, M. Pollefeys, M. Kampel “Classification and Pose Estimation of Vehicles in Videos by 3D Modeling within Discrete-Continuous Optimization”, In Proc. of the 2nd Int. Conf. on 3D Imaging, Modeling, Processing, Visualization and Transmission (3DIMPVT), pp 198-205, Zurich, Switzerland, October 2012. A. Zweng, M. Kampel “Improved Relational Feature Model for People Detection using Histogram Similarity Functions”, 9th IEEE Int. Conference on Advanced Video and Signal-Based Surveillance (AVSS), pp.422-427, Beijing, China, September 2012. M. Gau, A. Redi, I. Redi, M. Kampel “Responsive Open Space – Sound and Image in Public Spaces”, in Proc. of the 18th IEEE Int. Conference on Virtual Systems and Multimedia, Milan, Italy, 2-5 September 2012. Kavelar A., Zambanini S., Kampel M. “Word Detection Applied to Images of Ancient Roman Coins“, 18th Int. Conference on Virtual Systems and Multimedia – VSMM 2012, pp. 577 – 580, Milan, Italy, September 2012. A. Zweng, T. Poenitz, M. Kampel “Phil The Box: Estimating the Distribution Range of Vienna’s free of cost Newspapers”, Joint 34th DAGM and 36th OAGM Symposium, (DAGM’12, CVAW), Graz, Austria, 28-31 August 2012. Huber-Mörk R., Nölle M., Rubik M., Hödlmoser M., Kampel M., Zambanini S., “Automatic Coin Classification and Identification”, Advances in Object Recognition Systems, Dr. Ioannis Kypraios (Ed. ), ISBN: 978-953-51-0598-5, InTech, 2012. Berndt R-D., Takenga M.C., Kuehn S., Preik P., Berndt S., Brandstoetter M., Planinc R., Kampel M. “An Assisted Living System for the Elderly – FEARLESS Concept”, Proceedings of the IADIS Multi Conference on Computer Science and Information Systems (eHealth2012), pp. 131-138, Lisbon, Portugal, July 2012. Kavelar A., Zambanini S., Kampel M. “Automatically Recognizing the Legends of Ancient Roman Imperial Coins”, 40th Annual Int. Conference on Computer Applications and Quantitative Methods in Archaeology – CAA2012, Southampton, UK, March 2012. Zambanini S., Kampel M.“Using Image Analysis to Match a Coin to a Database”, 40th Annual Int. Conference on Computer Applications and Quantitative Methods in Archaeology – CAA2012, pp. 195-199, Southampton, UK, March 2012. M. Hödlmoser, B. Micusik, M. Kampel , “Camera Auto-Calibration Using Pedestrians and Zebra-Crossings” – In Proc. of the 11th IEEE Int. Conference on Computer Vision Workshop on Visual Surveillance (ICCV-VS), pp. 1697-1704, Barcelona, Spain, November 2011. A. Zweng, M. Kampel “Introducing Confidence Maps to Increase the Performance of Person Detectors”, 7th Int. Symposium on Visual Computing (ISVC’11), pp.446-455, Las Vegas, Nevada, September 2011. M. Hödlmoser, B. Micusik, M. Kampel, “Exploiting Spatial Consistency for Object Classification and Pose Estimation”, In Proc. of the 18th IEEE Int. Conference on Image Processing (ICIP), pp. 1009-1012, Brussels, Belgium, September 2011. A. Zweng, T. Rittler, M. Kampel “Evaluation of Histogram-Based Similarity Functions for Different Color Spaces”, 14th Int. Conference on Computer Analysis of Images and Patterns (CAIP 2011), pp. 455-462, Sevilla, Spain, Aug. 2011. Planinc R., Kampel M., “Emergency System for Elderly – a Computer Vision Based Approach”, Proceedings of the 3rd Int. Workshop on Ambient Assisted Living, pp. 79-83, Malaga, Spain, June 2011. Planinc R., Kampel M., Zambanini S., “Audiovisual Assistance for the Elderly – An Overview of the FEARLESS Project “, 9th International Conference on Smart Homes and Health Telematics, Montreal, Canada, pp. 225-229, June 2011. M. Hödlmoser, C. Bober, M. Kampel., “Vehicle Guidance Implemented on a Single-Board Computer” – In Proc. of the 1st Conference 3D Imaging, Modeling, Processing, Visualization, Transmission (3DIMPVT), Hanghzou, China, May 2011. Zambanini S., Kampel M., Vondrovec K. “The ILAC Project – An Automatic Image-Based Classification System for Historical Coins”, 39th Annual Int. Conference on Computer Applications and Quantitative Methods in Archaeology – CAA2011, Beijing, China, April 2011. Zweng A., Zambanini S., Kampel M., ”Introducing a Statistical Behavior Model into Camera-Based Fall Detection”, 6th Int. Symposium on Visual Computing, Las Vegas, USA, pp. 163-172, December 2010. Machajdik J., Zambanini S., Kampel M., ”Fusion of Data from Multiple Cameras for Fall Detection”, 33rd Annual German Conference on Artificial Intelligence, Workshop on Behaviour Monitoring and Interpretation, Karlsruhe, Germany, pp. 1-7, September 2010. 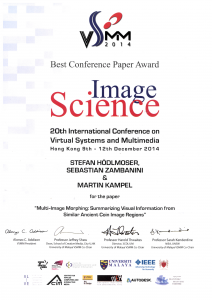 Zweng A., Kampel M., “Unexpected Human Behavior Recognition in Image Sequences using Multiple Features”, 20th Int. Conf. on Pattern Recognition (ICPR10), pp. 368-371, Istanbul, Turkey, Aug. 2010. Kloihofer W., Kampel M., “Recognition based Tracking” in Proc. of the 20th Int. Conf. on Pattern Recognition (ICPR10), Istanbul, Turkey, Aug. 2010. Zweng A., Kampel M., “Detecting Unexpected Behavior in Image Sequences”, 34th Workshop of the Austrian Association of Pattern Recognition (OAGM/AAPR’10), pp. 31-38, Zwettl, Austria, May 2010. Hödlmoser M., Kampel M., “Towards Calibration Using Off-the-shelf Cameras”, In Proc. of the 34th Workshop of the Austrian Association of Pattern Recognition (OAGM/AAPR’10), pp. 97-104, Zwettl, Austria, May 2010. Musik C., Vogtenhuber S., Blauensteiner P., Kampel M., “Automated detection of security critical scenarios in bank foyers by image analysis: A review”, Global Surveillance Society Conf., London, UK, Apr. 2010. Hödlmoser M., Zollner H., Kampel M., “An Evaluation of Camera Calibration Methods Using Digital Low Cost Cameras”, in Proc. of the 15th Computer Vision Winter Workshop (CVWW’10), Nove Hrady, Czech Republic, Feb. 2010. Zambanini S., Schlapke M., Hödlmoser M., Kampel M., ”3D acquisition of historical coins and its application area in numismatics”, Proc. of SPIE, 7531:753108, San Jose, USA, January 2010. Zambanini S., Herrmann M., Kampel M., “An Automatic Method to Determine the Diameter of Historical Coins in Images”, 2nd Conference Scientific Computing for Cultural Heritage (SCCH’09), Heidelberg, Germany, November 2009. Zweng A., Kampel M., “High Performance Implementation of License Plate Recognition in Image Sequences”, 5th Int. Symposium on Visual Computing (ISVC’09), LNCS, pp. 598-607, 2009. Kampel, M., Zambanini, S., Schlapke, M., Breuckmann, B., “Highly Detailed 3D Scanning of Ancient Coins”, Proc. of the XXII CIPA Conf., Kyoto/Japan, 2009. Liensberger CH., Stöttinger J., Kampel M., “Color-Based and Context-Aware Skin Detection for Online Video Annotation”, in Procs. of the IEEE 2009 Int. Workshop on Multimedia Signal Processing, Rio de Janeiro/Brazil, Oct. 5-7, 2009. Liensberger Ch., Stöttinger J., Kampel M., “Color-Based Skin Detection and its Application in Video Annotation”, 14th Computer Vision Winter Workshop (CVWW’09), CD-ROM, 2009. Zweng A., Kampel M., “Robust Number Plater Recognition in Image Sequences”, Int. Joint Conf. on Computer Vision, Imaging and Computer Graphics Theory and Applications (VISAPP09), pp. 56-63, 2009. Kampel M., Zaharieva M., “Recognizing ancient coins based on local features”, in Proc. of the Object Recognition Workshop of the 4th Int. Symposium on Visual Computing (ISVC’08), Las Vegas/USA, 2008. Kampel M., Zaharieva M., “Recognizing ancient coins based on local features”. Advances in Visual Computing (ISVC’08), Springer. LNCS 5358/2008. pp. 11-22, 2008. Kampel M., Vondrovec K., Zaharieva M., Zambanini S., “Image-Based Classification of Ancient Coins”, Proc. of the 14th International Conference on Virtual Systems and Multimedia, (VSMM 2008), Limassol, Cyprus, pp. 341-349, October 2008. Khan R., Stöttinger J., Kampel M., “An Adaptive Multiple Model Approach for Fast Content-Based Skin Detection in On-Line Videos”, ACM Multimedia 2008 WS-Analysis and Retrieval of Events/Actions and Workflows in Video Streams, Vancouver/Canada, pp. 89-95, Oct. 31st. 2008. Drenik M., Kampel M., “An evaluation of low cost scanning versus industrial 3D scanning devices”, IEEE Int. Conf. on Image and Signal Processing (CISP 2008), Hainan/China, pp. 756-769, 2008. Kampel M., Zaharieva M., “Optical recognition of medieval coins”, 35th Conf. on Computer Applications and Quantitative Methods in Archaeology (CAA’07), Berlin/Germany, Apr. 2007, in press. Zaharieva M., Kampel M., Zambanini S., “Image based recognition of coins – An Overview of the COINS project”, 31st AAPR/OAGM Workshop, Krumbach/Austria, pp. 57-64, 2007. Mara H., Niccolucci F., Kampel M., Sablatnig R., “Ancient Coins & Ceramics – 3D and 2D Documentation for preservation and retrieval of lost Heritage”, In F. Remondino and S. El-Hakim, editors, Proc. of the 2nd ISPRS Int. Workshop on 3D Virtual Reconstruction and Visualization of Complex Architectures (3D-ARCH 2007), vol. XXXVI-5/W47 of Int. Archives of Photogrammetry, Remote Sensing and Spatial Information Sciences, pp. 10-18, 2007. Zaharieva M., Kampel M., Zambanini S., “Image based recognition of ancient coins”. 12th International Conference on Computer Analysis of Images and Patterns (CAIP2007), pp. 547–554, 2007. Zaharieva M., Kampel M., Vondrovec K., “From manual to automated optical recognition of ancient coins“, 13th Int. Conf. on Virtual Systems and Multimedia (VSMM’07), LNCS Vol 4820, Brisbane/Australia, pp. 88-99, 2008. Zaharieva M., Huber-Mörk R., Nölle M., Kampel M., “On ancient coin classification”, 8th Int. Symposium on Virtual Reality, Archaeology and Cultural Heritage (VAST’07). pp. 55-62, 2007. Aguilera J., Thirde D., Kampel M., Borg M., Fernandez G., Ferryman J., “Visual Surveillance and Monitoring for an Airport’s Apron”, in O. Chum and V. Franc (Eds. ), Proc. of the 11th CVWWS6: Computer Winter Vision Workshop“, Telc/Czech Republic, Feb. 6-8th 2006, pp. 5-10. Matusek F., Kampel M., “Shadow Detection based on Chromaticity and Intensity Thresholding”, O. Chum and V. Franc (Eds. ), “Proc. of the 11th CVWWS6: Computer Winter Vision Workshop“, Telc/Czech Republic, Feb. 6-8th, pp. 148-152. Blauensteiner P., Wildenauer H., Hanbury A., Kampel M., “On Colour Spaces for Change Detection and Shadow Suppression”, O. Chum and V. Franc (Eds. ), “Proc. of the 11th CVWWS6: Computer Winter Vision Workshop“, Telc/Czech Republic, Feb. 6-8th 2006, pp. 117-123. Thirde D., Borg M., Ferryman J., Aguilera J., Kampel M, Fernandez G., “Multi-Camera Tracking for Airport Surveillance Applications”, in O. Chum and V. Franc (Eds. ), “Proc. of the 11th CVWWS6: Computer Winter Vision Workshop“, Telc/Czech Republic, Feb 6-8th 2006, , pp. 87-92. Kampel M., Aguilera J., Thirde D., Borg M., Fernandez G., Wildenauer H., Ferryman J., “3D Object Localisation and Evaluation from Video Streams”, in: F. Lenzen, O. Scherzer, and M. Vincze (Eds. ), “28th Workshop of the Austrian Association for Pattern Recognition (AAPR), Digital Imaging and Pattern Recognitionand Pattern, Obergurgl/Austria, pp. 113-122, Mar. 2006. Kampel M., Sablatnig R., H. Mara, Lettner M., “3D Acquisition of Archaeological Fragments and Web based 3D Data Storage”, in Proc. of CAA06: Digital Discovery: Exploring New Frontiers in Human Heritage “, Fargo/USA, Apr. 18-23th 2006. Thirde D, Borg M, Valentin V., Bartelemy L., Aguilera J, Fernandez G, Ferryman J, Bremond F., Kampel M.,”People and Vehicle Tracking for Visual Surveillance”, in 6th IEEE Int. Workshop on Visual Surveillance ,pp. 169-176, Graz/Austria, May 2006. Kampel M., Mara H., Sablatnig R., “Automated Investigation of Archaeological Vessels”, in: M. Luise, (Ed. ), Proc. of EUSIPCO2006: 13th European Signal Processing Conf., Florence/Italy, Sept. 4-8 2006. Kampel M., Sablatnig R., “3D Data Retrieval for Archaeological Pottery“, in: H.Z.Z. Pan, H. Thwaites, A.C. Addison, M. Forte, (Eds. ), Interactive Technologies and Sociotechnical Systems, Proc. of 12th Int. Conf., VSMM 2006, Xi’an, China, October 18-20, Springer Lecture Notes in Computer Science Vol. 4270, pp. 387-395, 2006. Wildenauer H., Blauensteiner P., Hanbury A., Kampel M., “Motion Detection using an Improved Colour Model”, “Proc. of the 2nd Int. Symposium on Visual Computing (ISVC06)“, Lake Tahoe/USA, pp. 607-616, Nov. 6th-8th 2006. Blauensteiner P., Wildenauer H., Hanbury A., Kampel M., “Motion and Shadow Detection with an Improved Colour Model”, Proc. of the IEEE Int. Conf. on Signal and Image Processing (ICSIP06), Hubli/India, pp. 627-632, Dec. 7th-9th 2006. Aguilera J., Kampel M., Blauensteiner P., “Robust Detection and Performance Evaluation of Individuals and Vehicles on an Airport’s Apron”, in: Hanbury A., Bischof H., (Eds. ), Proc. of the 10th Computer Vision Winter Workshop, Zell an der Pram/Austria, pp. 145-154, 2005. Aguilera J., Kampel M., “On the Detection of Individuals and Vehicles on an Airport`s Apron”, in Proc. of IEE Int. Conf. on Visual Information Engineering, Glasgow/UK, pp. 107-114, Apr. 2005. Kampel M., Sablatnig R., Mara H., “Robust 3D Reconstruction of Archaeological Pottery based on Concentric Circular Rills”, in N. Magnenat-Thalmann and J.H. Rindel (Eds. ), WIAMIS05: The 6th Int. Workshop on Image Analysis for Multimedia Interactive Services, Montreux, Switzerland, pp. 14-20, April 2005. Wildenauer H., Aguilera J., Kampel M., “An Evaluation of Error Metrics for the Segmentation of Moving Objects on an Airport’s Apron”, in: D. Chetverikov, L. Czuni, and M. Vincze (Eds. ), “Joint Hungarian-Austrian Conf. on Image Processing and Pattern Recognition, Veszpram/Hungary, pp. 119-126, May 2005. Kampel M., Mara H., Sablatnig R., “Investigation on Traditional and Modern Ceramic Documentation“, in G. Vernazza, and G. Sicuranza (Eds. ), ICIP05: Int. Conf. on Image Processing, Genova/Italy, pp. 570-573, Sep. 2005. Aguilera J., Wildenauer H., Kampel M., Borg M., Thirde D., Ferryman J., “Evaluation of Motion Segmentation Quality for Aircraft Activity Surveillance”, in: “Proc. of the Second Joint IEEE Int. Workshop on Visual Surveillance and Performance Evaluation of Tracking and Surveillance”, Beijing/China, pp. 293-300, Oct. 2005. Borg M., Thirde D., Aguilera J., Ferryman J., Baker K., Kampel M., “Evaluation of Object Tracking for Aircraft Activity Surveillance”, In Proc. of the Second Joint IEEE Int. Workshop on Visual Surveillance and Performance Evaluation of Tracking and Surveillance, Beijing/China, pp. 145-152, 2005. Thirde D., Borg M., Valentin V., Fusier F., Aguilera J., Ferryman J., Bremond F., Thonnat M., Kampel M., “Visual Surveillance for Aircraft Activity Monitoring”, in: “Proc. of the Second Joint IEEE Int. Workshop on Visual Surveillance and Performance Evaluation of Tracking and Surveillance”, Beijing/China, pp. 255-262, Oct. 2005. Thirde D., Borg M. , James Ferryman, Aguilera J., Kampel M., “Distributed Multi-Camera Surveillance for Aircraft Servicing Operations”, in “Int. Symposium on Visual Computing”, pp. 118-125, Nevada/USA, Dec. 2005. Ferryman J., Borg M., Thirde D. Fusier F., Valentin V., Bremond F., Thonnat M., Aguilera J., Kampel M., “Automated Scene Understanding for Airport Aprons”, in “Australian Joint Conf. on Artificial Intelligence”, pp. 593-603, Sydney/Australia, Dec., 2005. Kampel M., Sablatnig R., “3D Puzzling of Archeological Fragments”, in: Skocaj D., (Ed. ), “Proc. of the 9th Computer Vision Winter Workshop“, Piran/Slovenia, pp. 31-40, 2004. Kampel M., Sablatnig R., “Detection of matching fragments of pottery”, in: “Proc. of the CAA04: Beyond the artifact digital interpretation of the past,” Prato/Italy, Apr. 12-17th 2004, in press. Blauensteiner P., Kampel M., “Visual Surveillance of an Airport’s Apron – An Overview of the AVITRACK Project”, in: Burger W., Scharinger J., (Eds. ), “Digital Imaging in Media and Education, Proc. of the 28th Workshop of the Austrian Association for Pattern Recognition (OAGM/AAPR)“, Schriftenreihe der OCG, Vol. 179, pp. 213-220, 2004. Kampel M., Sablatnig R., “On 3D Mosaicing of Rotationally Symmetric Ceramic Fragments”, in: Kittler J., Petrou M., Nixon M., (Eds. ), Proc. of 17th Int. Conf. on Pattern Recognition, Vol.2, pp. 265-268, 2004. Sablatnig R., Tosovic S., Kampel M., “Next View Planning for Shape from Silhouette”, in: Drbohlav O., (Ed. ), “Proc. of 8th Computer Vision Winter Workshop 2003, Valtice/Czech Republic“, pp. 77-82, 2003. Mara H., Kampel M., “Profile Extraction of Archaeological Fragments for Classification”, in: Drbohlav O., (Ed. ), Proc. of 8th Computer Vision Winter Workshop 2003, Valtice/Czech Republic, pp. 62-72, 2003. Kampel M., Sablatnig R. , “New Achievements on pottery reconstruction”, in “Proc. of the CAA2003: Computer Applications and Quantitative Methods in Archaeology Conf. : “The E-Way into the four Dimensions of Cultural Heritage“, Vienna/Austria, Apr. 8-12, 2003, in press. Mara H. , Kampel M. , “Automated Extraction of Profiles from 3D Models of Archaeological Fragments”, in: “CIPA2003: XIX CIPA Int. Symposium: New Perspectives to Save Cultural Heritage“, Antalya/Turkey, pp. 87-93, 2003. Sablatnig R., Tosovic S., Kampel M., “A Next View Planning Technique for Shape from Silhouette and Shape from Structured Light”, in Beleznai C., Schlögl T.(eds), Vision in a Dynamic World Laxenburg: 27th Workshop of the Austrian Association for Pattern Recognition (AAPR), Schriftenreihe der OCG, Vol 168, pp. 65-72, 2003. Kampel M., Sablatnig R., “Profile based Pottery Reconstruction”, in Martin D. (ed). IEEE/CVPR Workshop on Applications of Computer Vision in Archaeology, CD-ROM, Madison/USA, 2003. Kampel M., Sablatnig R., “Virtual Reconstruction of Broken and Unbroken Pottery”, in Heritage Applications of 3-D Imaging and Modeling, Special Session of 4th Int. Conf. on 3-D Digital Imaging and Modeling”, Banff, Alberta/Canada, pp. 318-325, 2003. Sablatnig R., Tosovic S., Kampel M., “Next View Planning for a Combination of Passive and Active Acquisition Techniques”, in 4th Int. Conf. on 3-D Digital Imaging and Modeling“, Banff, Alberta/Canada, pp. 62-69, 2003. Kampel M., Melero F. J., “Virtual Fragment Reconstruction from a Fragment`s Profile”, in: Arnold D., Chalmers A., Niccolucci F., (Eds. ), “Proc. of 4th Int. Symposium on Virtual Reality, Archaeology and Intelligent Cultural Heritage “, Brighton, United Kingdom, pp. 75-84, 2003. Cosmas J., Itegaki T., Green D., Joseph N., Van Gool L., Zalesny A., Vanrintel D., Leberl F., Grabner M., Schindler K., Karner K., Gervautz M., Hynst S., Waelkens M., Vergauwen M., Pollefeys M., Cornelis K., Vereenooghe T., Sablatnig R., Kampel M., Axell P., Meyns E., “Providing Multimedia Tools for Recording, Reconstruction, Visualisation and Database Storage/Access of Archaeological Excavations”, in: Arnold D., Chalmers A., Niccolucci F., (Eds. ), “Proc. of 4th Int. Symposium on Virtual Reality, Archaeology and Intelligent Cultural Heritage “, Brighton/UK, pp. 183-192, 2003. Sablatnig R., Tosovic S., Kampel M., “Volume Computation of Archaeological Vessels”, in: B. Mafart, H. Delingette, (Eds. ), Proc. of 14th Congress of the Int. Union of Prehistoric and Protohistoric Sciences – Three Dimensional Imaging in Paleoanthropology & Prehistoric Archeology, BAR Int. Series Vol. 1049, pp. 93–99, 2002. Kampel M., Sablatnig R., “Computer Aided Classification of Ceramics”, in: Niccolucci F. (Ed. ), “Virtual Archaeology: Proc. of the VAST2000 EuroConf., Arezzo, Oxford/UK Archaeopress, pp. 77-82, 2002. Tosovic S., Sablatnig R., Kampel M., “On Combining Shape from Silhouette and Shape from Structured Light”, in: Wildenauer H., Kropatsch W., (Eds. ), “Proc. of 7th Computer Vision Winter Workshop“, pp. 108-118, 2002. Kampel M., Sablatnig R., Mara H., “Profile Segmentation Scheme for Automated Classification of Archaeological Sherds”, in: CAA2002: Computer Applications and Quantitative Methods in Archaeology Conf. : The Digital Heritage of Archaeology, Heraklion, Crete/Greece, pp. 275-280, 2002. Kampel M., Tosovic S., Sablatnig R., “Octree-based Fusion of Shape from Silhouette and Shape from Structured Light”, in: G. M. Cortelazzo and C. Guerra (Ed. ), 3DPVT02: 1st IEEE Int. Symposium on 3D Data Processing Visualization and Transmission, Padua/Italy, pp. 754-757, 2002. Kampel M., Sablatnig R., “Automated Segmentation of Archaeological Profiles for Classification”, in: Kasturi R., Laurendeau D., Suen C., (Eds. ), Proc. of 16th Int. Conf. on Pattern Recognition, Vol.1, pp.57-60, 2002. Sablatnig R., Tosovic S., Kampel M., “Combining Shape from Silhouette and Shape from Structured Light for Volume Estimation of Archaeological Vessels”, in: Kasturi R., Laurendeau D., Suen C., (Eds. ), Proc. of 16th Int. Conf. on Pattern Recognition, Vol.1, pp. 364-367, 2002. Kampel M., Sablatnig R., Tosovic S., “Volume based Reconstruction of Archaeological Artifacts”, in: Boehler W., (Ed. ), Proc. of Int. Workshop on Scanning for Cultural Heritage Recording, pp. 76-83, 2002. Mara H., Kampel M., Sablatnig R., “Preprocessing of 3D-Data for Classification of Archaeological Fragments in an Automated System”, in: Leberl F., Fraundorfer F., (Eds. ), Vision with Non-Traditional Sensors, Proc. of the 26th Workshop of the Austrian Association for Pattern Recognition (AAPR), Schriftenreihe der OCG, Vol. 160, pp. 257-264, 2002. Kampel M., Sablatnig R., Tosovic S., “Fusion of Surface and Volume Data”, in: Leberl F., Fraundorfer F., (Eds. ), Vision with Non-Traditional Sensors, Proc. of the 26th Workshop of the Austrian Association for Pattern Recognition (AAPR), Schriftenreihe der OCG, Vol. 160, pp. 21-28, 2002. Kampel M., Sablatnig R., Mara H., “Automated Documentation System of Pottery”, in: Magnenat-Thalmann N., Rindel J.H., (Eds. ), “Proc. of 1st Int. Workshop On 3d Virtual Heritage, Geneva/Switzerland“, pp. 14-20, 2002. Kampel M., Liska C., Tosovic S., “Adaptive 3d reconstruction of archaeological pottery”, in: “Proc. of the IS&T/SPIE Symposium on Machine Vision Applications in Industrial Inspection IX , San Jose/USA, SPIE-Vol. 4301, pp. 42-51, 2001. Sablatnig R., Kampel M., “The Virtual Reconstruction of an Archaeological Site – An Overview of the MURALE Project”, in: Likar B., (Ed. ), ” Proc. of 6th Computer Vision Winter Workshop 2001″, pp. 60-70, 2001. Kampel M., Sablatnig R., Costa E., “Classification of Archaeological Fragments using Profile Primitives”, in: Scherer S. (Ed. ), “Computer Vision, Computer Graphics and Photogrammetry – a Common Viewpoint, Proc. of the 25th Workshop of the Austrian Association for Pattern Recognition (AAPR)“, Schriftenreihe der OCG, Vol. 147, pp. 151-158, Oldenburg, Wien, München, 2001. Kampel M., Sablatnig R., “Automated 3d Recording of Archaeological Pottery”, in D. Bearman and F. Garzotto (Ed.) Proc. of the Int. Conf on Cultural Heritage and Technologies in the Third Millennium Milan/Italy, Vol. 1, pp. 169-182, Sept. 2001. Kampel M., Sablatnig R., Tosovic S., “3d shape modelling of objects with concavities”, in Proc. of the Int. European Conf. on Visual Perception, Kusadasi/Turkey, August 26-30, 2001. Schindler K., Kampel M., Sablatnig R., “Fitting of a Closed Planar Curve Representing a Profile of an Archaeological Fragment”Proc. of Int. EuroConf. on Virtual Reality, Archaeology and Cultural Heritage“, Athens/Greece, pp. 263-269, Nov. 2001. Cosmas J., Itagaki T., Green D., Grabczewski E., Van Gool L., Zalesny A., Vanrintel D., Leberl F., Grabner M., Schindler K., Karner K., Gervautz M., Hynst S., Waelkens M., Pollefeys M., DeGeest R., Sablatnig R., Kampel M., “3D MURALE: A Multimedia System for Archaeology”, in: “Proc. of Int. EuroConf. on Virtual Reality, Archaeology and Cultural Heritage“, Athens/Greece, pp. 297-305, Nov. 2001. Kampel M., Sablatnig R., “Dreidimensionale Oberflächenrekonstruktion archäologischer Scherben zur Klassifizierung”, in: Stanke G., Paul L., Pochanke M. (Eds. ), “Proc. of 3D-NordOst 2001: 4. Anwendungsbezogener Workshop zur Erfassung, Verarbeitung, Modellierung und Auswertung von 3D-Daten“, Berlin/Germany, pp. 75-82, 2001. Kampel M., Sablatnig R., “Color Classification of Archaeological Fragments”, in: “Proc. of the 15th Int. Conf. on Pattern Recognition, Barcelona/Spain, Vol.4, pp. 771-774, 2000. Kampel M., Sablatnig R., “Color Classification of Ceramics using Spectral Reflectance”, in: “Proc. of the 1st Int. Conf. on Color in Graphics and Image Processing“, Saint-Etienne/France, pp. 323-327, 2000. Kampel M., Tosovic S.,”Turntable Calibration for automatic 3D Reconstruction” in “Applications of 3D-Imaging and Graph-based Modeling 2000, Proc. of the 24th Workshop of the Austrian Association for Pattern Recognition (OEAGM)”, Schriftenreihe der OCG, Vol. 142, pp. 1-9, 2000. Kampel M., Sablatnig R.,”Range Image Registration of Rotationally Symmetric Objects”, in Brändle N. (Ed. ), “Proc. of Computer Vision Winter Workshop, Rastenfeld/Austria, pp. 69-74, 1999. Kampel M., Sablatnig R., “A Model-based Approach to Range Image Registration”, in: Vincze M., (Ed. ), “Robust Vision for Industrial Applications, Proc. of the 23rd Workshop of the Austrian Association for Pattern Recognition (AAPR)”, Steyr, Austria, Schriftenreihe der OCG, Vol. 128, pp. 109-117, Oldenburg, Wien, München, 1999. Sablatnig R., Kampel M., “On Registering Front- and Backviews of Rotationally Symmetric Objects”, in: Solina F., Leonardis A.,”Proc. of 8th Int. Conf. on Computer Analysis of Images and Patterns“, Lecture Notes in Computer Science, Ljubljana/Slovenia, Vol. 1689, pp. 339-346, Springer Verlag, 1999. Kampel M., Sablatnig R., “On 3d Modelling of Archaeological Sherds”, in: Sarris N., Strinzis M.G., (Eds. ), “Proc. of Int. Workshop on Synthetic-Natural Hybrid Coding and Three Dimensional Imaging“, Santurini/Greece, pp. 95-98, 1999. Kampel M., Liska C., “Zwei computerunterstützte Methoden zur bildhaften Erfassung archäologischer Fundstücke” Forum Archaeologiae, 06.03.1998. Kampel M., “Tiefendatenregistrierung von rotationssymmetrischen Objekten”, Master Thesis, PRIP-TR056, Institute for Automation, Vienna University of Technology, 1999. Kampel M., Computer aided analysis of ancient coins: EVA Conf. on Digital Cultural Heritage – Essential for Tourism (EVA’08), Vienna/Austria, pp.137-144, 2008. Kampel M., Sablatnig R., “On using 3D Multimedia Tools to measure, reconstruct and visualize an Archaeological Site”, in: Forum Archaeologiae, Zeitschrift für klassische Archäologie, Vol.19/4, 2001. Adler K., Kampel M., Kastler R., Penz M., Sablatnig R., Schindler K., Tosovic S., ” Computer Aided Classification of Ceramics – Achievements and Problems”, in: W. Börner, L. Dollhofer (Eds.) Proc. of 6th Int. Workshop on Archaeology and Computers, Vienna/Austria, pp. 3-12, 2001. Kampel M., Sablatnig R., “Automated Archivation System of Pottery”, in: Wittig T. “Amman Cultural Heritage Conf., Multimedia for Cultural Heritage“, Amman/Jordan, pp. 39-43, 2002. Cosmas J., Itegaki T., Green D., Grabczewski E., Weimer F., Gool L. Van, Zalesny A., Vanrintel D., Leberl F., Grabner M., Schindler K., Karner, Gervautz M., Hynst S., Waelkens M., Pollefeys M., DeGeest R., Sablatnig R., Kampel M., “A Novel Multimedia System for Archaeology”, in: Proc. of Forum Int. de Musees. Museum National d’Histoire Naturelle, Paris, Apr. 3rd-4th 2002. Kampel M., “3D Mosaicing of Fractured Surfaces”, PhD-Thesis, Vienna University of Technology, 2003. Kampel M., Sablatnig R., “Automatisierte Dokumentation von Keramikfunden aus Palpa auf Grundlage eines 3D-Erfassungssystem / La documentacion automatizada de ceramica basada en un sistema de registro tridimensional aplicada a hallazgos ceramicos de Palpa”, in: M. Reindel, G.A. Wagner, (Eds. ), Broschüre zur Feldkonferenz des Projektverbundes NASCA: Entwicklung und Adaption Archäometrischer Techniken zur Erforschung der Kulturgeschichte / Simposio del proyecto interdisciplinario NASCA: Desarrollo y adaptacion de tecnicas arqueometricas para la investigation de la historia cultural, pp. 39-42, 2004. Kampel M., “Recognition and Reconstruction in Archaeology and Surveillance”, Habilitation-Thesis, Vienna University of Technology, 2009.